We are currently in the planning stage of a kitchen renovation, which basically involves ripping out lust-worthy pages from 'Home Beautiful', pinning kitchen inspiration, visiting kitchen showrooms, and saying things like 'one day, it'll be awesome to have a breakfast station/more storage/a bigger oven'.... So, still very early stages! Although there are changes I'm definitely looking forward to, I also firmly believe in working with what you currently have. I've rearranged things in my current kitchen lots of times to finally reach a storage set-up I am happy with, tweaking here and there to make it work in the most efficient way for our family. Organisation is definitely an on-going process, and that is a good thing! 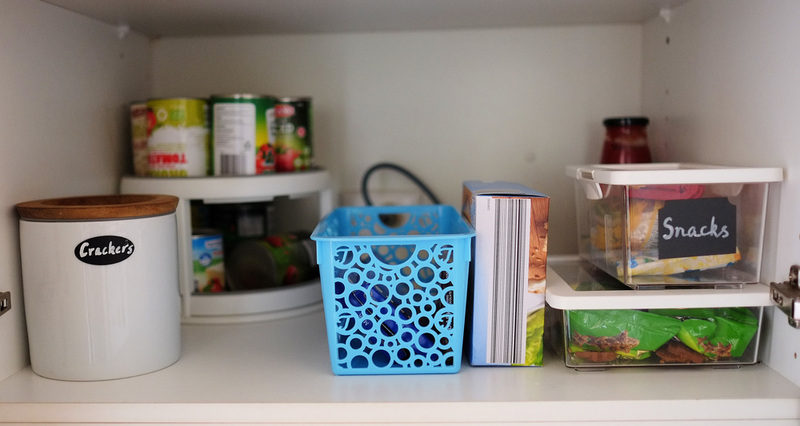 Today, I am showing you our organised pantry, and the adjustments we made recently that have been big game-changers in the way we use our kitchen. We have 2 cupboards dedicated to our pantry, with 6 deep shelves. This has its pros and cons - there is a lot of space, but it is harder to reach things at the back, and we can't access items on the top-most shelves. Of course, pull-out shelves are a great solution for deep shelves, but we are not wanting to invest any more into a kitchen we are hoping to completely redo in the very near future. 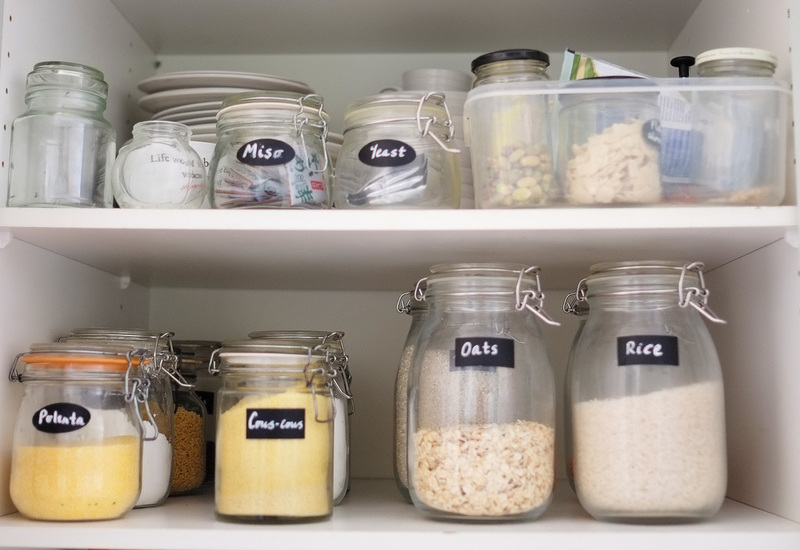 BONUS: Get the free guide for decluttering and organising your pantry by clicking on the button below! Our microwave used to live on the second bottom shelf. of the pantry. While it was handy to have it tucked away, we decided it would be more practical on the kitchen bench, as we actually use it a lot. Although it does take up quite a bit of bench space, it has provided us with much more usable pantry space... so sometimes you just have to weigh up what is more convenient and necessary! It is actually really useful to have the microwave, kettle, coffee machine, coffee and teas all in the one handy spot now. We also installed two Ikea floating shelves on the kitchen wall, right above the bench where we do all our food prep. These shelves were originally in our entryway, before the console made its grand appearance! The bench pictured below is where we make breakfast, prepare lunch boxes, have baking sessions with the kids and prep dinner. It is so handy to have all our breakfast items in easy reach on the floating shelves (making mornings run more smoothly), as well as the most-used items for my regular baking sessions. Now, back to the pantry... Nearly all of our produce is in sealed jars - I do this for two reasons. Firstly, I believe transferring food into jars or containers keeps it fresher for longer. This step really doesn't take me long at the end of a food shop. Secondly, when I'm writing the shopping list, I like to see at a glance how much of a particular item we have left. The jars aren't all matching, they are just ones I have collected over the years. The larger ones are from Ikea, some are from discount stores and others are from home storage stores. I got the blackboard labels from Etsy a while ago, and used a chalkboard marker pen to write labels. The marker rubs off with a damp cloth so it is easy to re-label if you want to change the contents of the jar. The top shelf holds extra plates and bowls for entertaining, spare jars, some miscellaneous items and a container that holds a variety of nuts. I don't really access this shelf much, as it is too high! The next shelf down holds oats, rice, grains, lentils, polenta etc. I only have four large jars because they are a bit awkward and heavy to move around. I got the following items from a kitchen storage store - a 3-tier shelf organiser, twin-turntable and under-shelf basket. 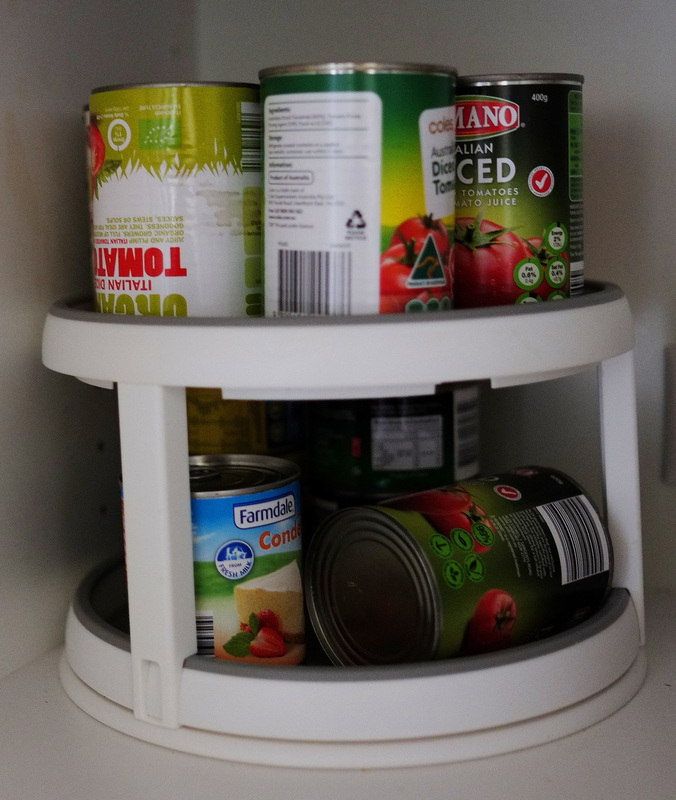 The tiered shelf organiser is useful for creating space for things like condiments, tins, jars etc. It took up too much space to have it facing forward so I put it on its side. It has a non-slip surface which is more practical than the wire step-shelves, which I found were quite slippery. This third shelf holds extra baking products, as well as ingredients for the muesli that I make once a week and have eaten every morning for the last 6 years - love it! The bottom shelf of the upper cupboards has the twin-turntable for cans. It can fit a decent amount on top and it spins for easy access, even though it's right at the back of that shelf. The one thing that irritates me is the bottom level isn't high enough to hold an upright can, so I just use it for smaller cans like tuna, condensed milk etc. This shelf is also where I keep snacks for the kids...and our chocolate stash belongs in the handy blue basket I got from the local discount store for just $3.50! I use these baskets throughout the kitchen for easy and decorative storage. 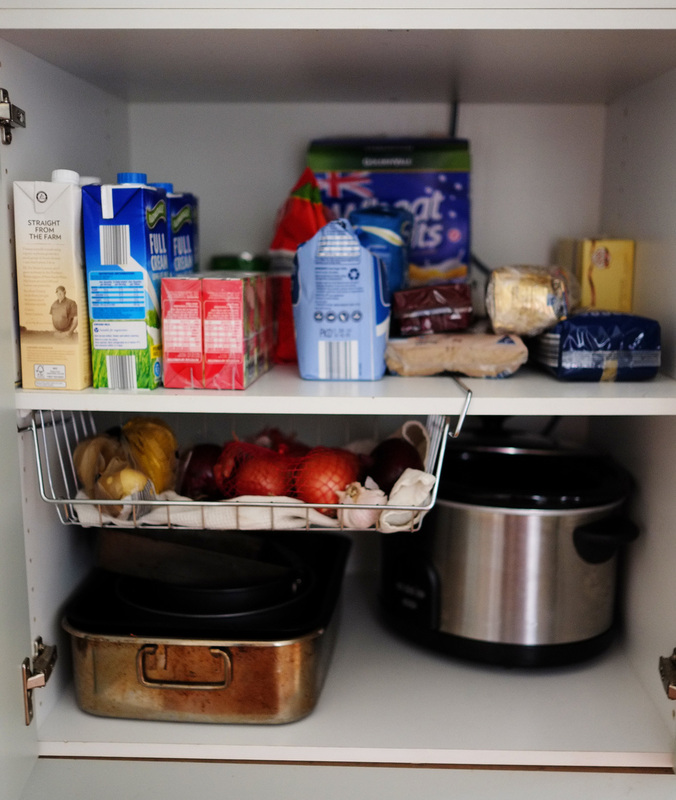 In the lower cupboard, we keep the long-life milk and all our extra/stock supplies. The under-shelf basket holds the onions, garlic and potatoes (I put a tea-towel at the bottom of it so the onion and garlic skins don't make a mess everywhere). 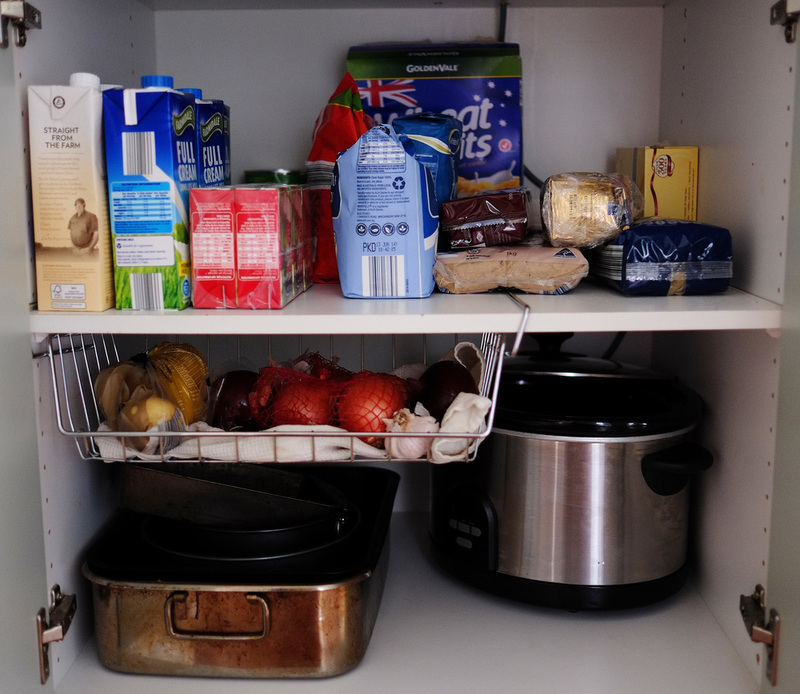 At the very bottom of the cupboard are those bigger and more awkward-to-store items, such as the slow-cooker and large roasting pans. We keep sauces in a cupboard above the rangehood, and spices and oils in a cupboard next to the stove-top.... but I'll save that for another post! 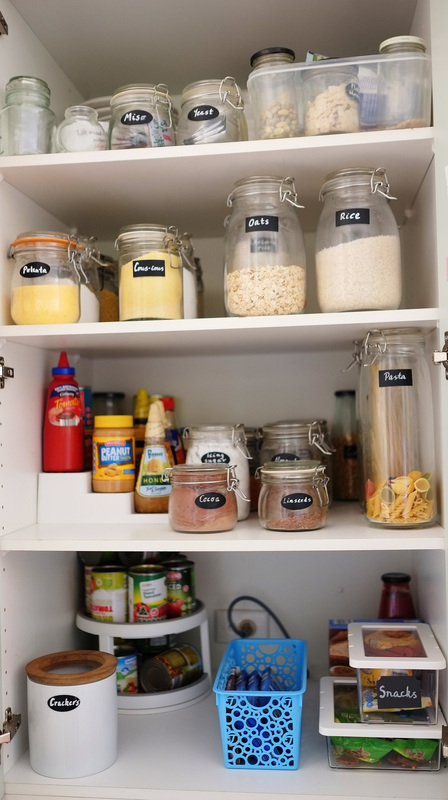 Don't forget to grab your free step-by-step guide to decluttering and organising your own pantry by clicking on the button below!